Inflatable yellow ducks and World War Two era tank sets. These are just some of the highlights of what Alestorm and Sabaton bring to the war room. It was a history lesson for those who didn’t quite wish to learn the traditional way, whether it was about the 1741 Battle of Cartagena, Swedish King Charles XII or the Battle of Midway. Education aside, both Alestorm and Sabaton have a reputation for thrilling entertainment, albeit in very different ways. There was absolutely no shortage of this on the day they turned their guns on Bristol, both broadsides and barrage. 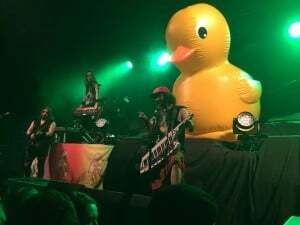 After an admirable performance from Bloodbound, Alestorm took the stage, complete with huge duck looming over them, a sign of comedy to come. Pirate metal was always bound to send the crowd into a frenzy, as it sure did when the band boarded the stage, wearing all manners of ridiculous outfits. Beginning with staple song ‘Keelhauled’, Alestorm came out firing on all cylinders and sure enough the audience came alive like a ship’s crew at general quarters. Alestorm are known for being a band with a sense of humour and a love for beer (hence the name). Throughout the set, the band pumped out volley upon volley of swigging tracks ‘The Sunk’n Norwegian’, ‘Shipwrecked’, a cover of Taio Cruz’ ‘Hangover’ and ‘Beer’ all being highlights. Frontman Christopher Bowes led the band in a merry stupor, complete with kilt, beer bottle and guitar to put on a fantastically entertaining show. Their reputation preceded them, but once they sailed into port, Alestorm left no rum barrel untouched, so to speak. Sabaton’s set was already underway even before they took to the stage, with the sight of a tank behind the cloths that draped the backdrop of the O2’s stage, perched atop was the drum kit, surrounded by 20th Century military equipment, including US Marine helmets and M16s to act as microphone stands, as well as netting and barbed wire. Sabaton’s artillery of music began with “Ghost Division’, before dive bombing into their most recent album ‘Heroes’ with ‘Far From The Fame’. Sabaton’s set was a little bogged down with some forced comedy, a far cry from the wit and outlandishness of Alestorm, but it didn’t detract from the music, except when vocalist Joachim Broden left the stage (which was staged…pun intended), so the band could perform a Swedish version of ‘Gott Mit Uns’. 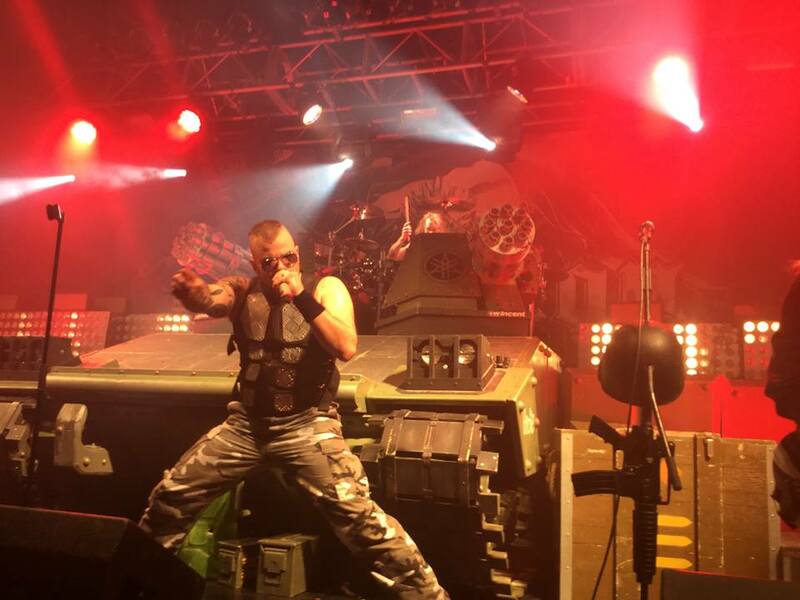 Sabaton were at their best with their newer material; the set spoke volumes to the nature of their tuneful tales of war and beyond. The crowd, having been battle-tested with Alestorm, were right behind the band with chants of “Sabaton!” after every song. Ending with a bombardment of signature tracks ‘Primo Victoria’ and ‘Metal Crue’, the Swedish power metal band had emerged victorious that night. The only adversary Sabaton faced was a somewhat muted sound in the guitars, apparently not a new issue, according to several in the audience. Despite this, the show was exhilarating, if only for the rabid audience and the authoritative presence of Sabaton’s pounding music. Here’s hoping they occupy Bristol again soon.